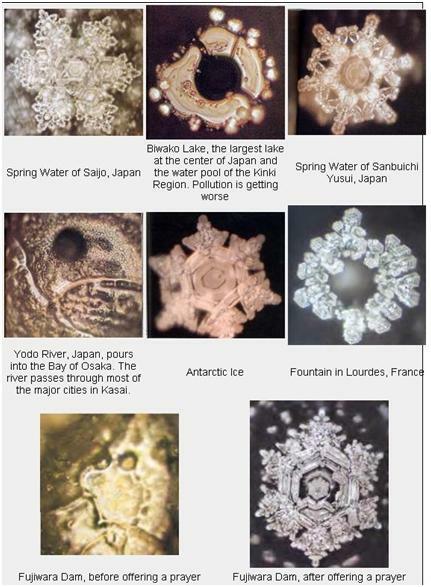 He expose water of same source to different type of music for a day ,he then frozen them for three hours and examine the crystal formation under dark field microscope and took photographs of those formations. He goes beyond that and studied the effect of words on the water , by exposing the water to one word all day, prayers, or even stick that word on side of the water glass ..new crystal shapes was formed! In Germany the have done the same experiment , this time the result of the same water changes once you change the experimenters , it means that the water remember people too! Dr. Emoto also experimented with cooked rice. He placed one cup of cooked rice in two airtight jars. On one jar, he wrote, “I love you,” and on the other, “You fool” . Everyday for 30 days, Dr. Emoto would say these words to each jar of rice. After 30 days, the “I love you” rice was still white. But the “You fool” rice was so rotten, it was black. How can you explain this? Aren’t You Made Up Of Water? I don’t want to go deep in details of the experiment , the only thing that we need to know is . If the words have that obvious impact on water and 70% of human being body weight is water with 90% of the brain is water !! what would be the impact of word on us ?!! Now , what is this has to do with sales techniques? The way you talk to yourself (I can't .. It is hard to .. impossible .. I am not good at this .. I hate cold calls ..too complicated for me ..) when you learn how to eliminate negative self talk and start your day with focusing on positive self talk by changing the same last phrases to positive ones (why not!! Yes I can.. It is not easy but .. achievable.. I will be good at this cause I can or I am still not good at this yet .. I am not used to cold calls yet .. I need more time to master it ) then you will program yourself for success and achieving your goals . Use others hypnotic words in order to manipulate them and be magical persuasive machine. If words have effect on water and most of you made up from water hence words has effect on you whether you are aware of it (conscious) or… NOT (subconscious)! !